BASKETBALL SPOTLIGHT NEWS: Tahaad "Give Me 3" Pettiford Shuts Down Clash For The Cup! Tahaad "Give Me 3" Pettiford Shuts Down Clash For The Cup! Tahaad Pettiford loves the big moment a when he is called upon will pull out the dagger and stick it deep (REMEMBER THE SLAM DUNK BREAST CANCER SHOT). The 2024 combo guard put on a huge show at the Clash For The Cup. He played 10 games over the weekend while leading Team Izod (8th Grade) and Jersey City Boys Club to championship game appearances. He capped his weekend off by nailing the game winning trey against Team Final in the closing moments of the 8th Grade Game. Pettiford tallied over 180 points over the weekend. Introducing Tahaad “Give Me 3” Pettiford. 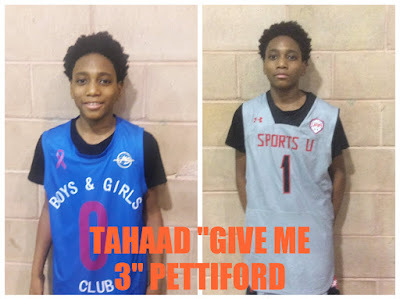 Tahaad "Give Me 3" Pettiford was ridicolous at the Clash For The Cup!